People in Philadelphia love drinking, makes sense, we're one of the 11 best imbibing cities in America. But you know what's even better than drinking? Doing it outdoors, especially now that it's... sorry 'bout this!... 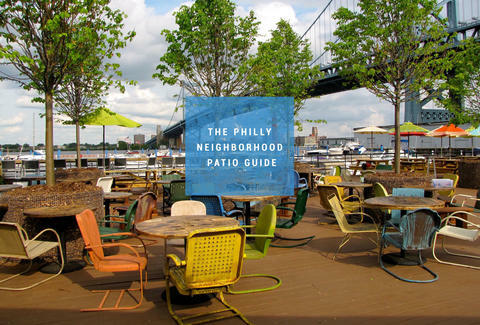 Always Sunny, which is why we're making it easy for you by picking the best outdoor drinking spots in 12 different local 'hoods. It doesn’t get much more Philly than drinking lager next to one of the city’s hundreds of murals. 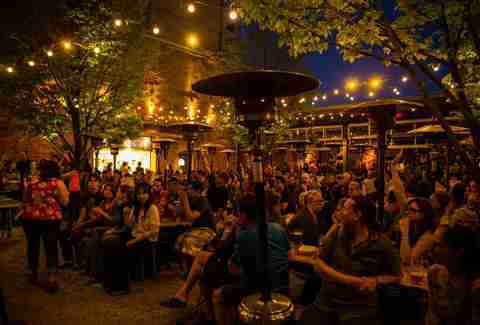 It’s also one of a handful of bars in close proximity to Union Transfer, making it the perfect pit stop for concert goers. The space also offers an extensive beer list, complete with rankings, that you’re welcome to enjoy once you get over all the llama paraphernalia. 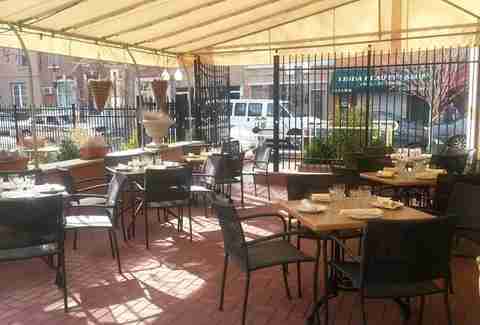 Besides being a stellar place to get top-notch Italian food, Le Virtu reps some of the best outdoor real estate of East Passyunk Ave, where people watching is fully available, yet guests still feel secluded from avenue passerby. In addition to six revolving craft beers on tap and 20+ other cans, the summer means a new menu of seasonal cocktails. 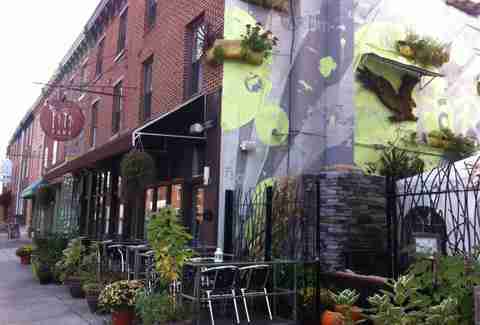 Fare is another outdoor spot repping Philly with a mural adorning the side of the restaurant’s outdoor space. You should totally stop in during happy hour for the essential combo of truffle fries and a dry martini. Natural light floods the indoor area of the Stephen Starr masterpiece so nicely that you might not even consider going outside -- but you should. Head to the back and you’re greeted with tables under twinkly lights for your German al fresco drinking and dining pleasure. 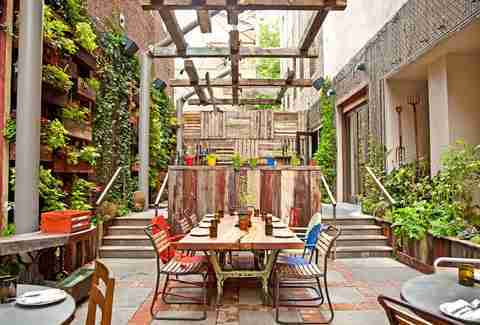 The outdoor space off the alley behind Sampan stays open all-year long, but now that it’s summertime not everyone will be flocking around the heating lamps in head-to-toe snow gear. 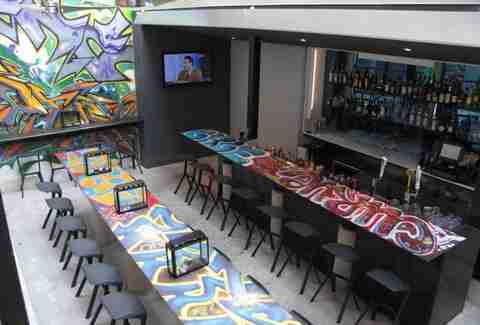 So your best bet is to order the fishbowl, stake out a prime-seating spot, and commence people watching. The Cambridge will draw you in with its extensive beer list and outdoor patio, and keep you coming back for its tantalizing "up next" beer menu that just gives you a sneaky glimpse of what you COULD order if you come back in a couple weeks. 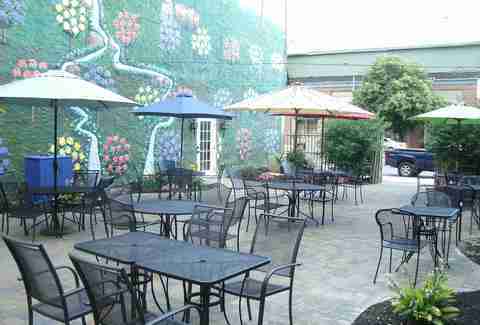 Plus, the outdoor area can be a quiet break from the glorious chaos across the street that is Bob & Barbara’s. The beer garden in closest proximity to the Liberty Bell is back for a second summer with a refreshed food and drink menu. On tap are dozens of locally sourced brews for when you need that extra dose of freedom in your beer. 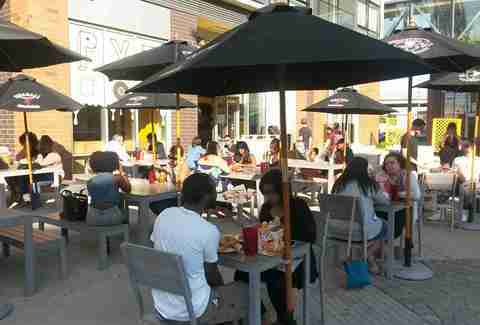 We all know PYT is one of Philly’s favorite ways to maintain our fat kid reputation, but in the summer it’s also an ideal place to slurp down an alcoholic milkshake, and vaguely participate in whatever outdoor event is going on at the Piazza at Schmidt's. International dance showcase? Gentle yoga? If PYT remains, so do we. Take in the vista of America’s armpit (sorry, I mean New Jersey) from the deck of Morgan’s Pier. At this extensive waterfront’s beer garden, you can even cure your hangover thanks to a weekend brunch menu that includes bacon-and-shrimp adorned Bloody Marys. 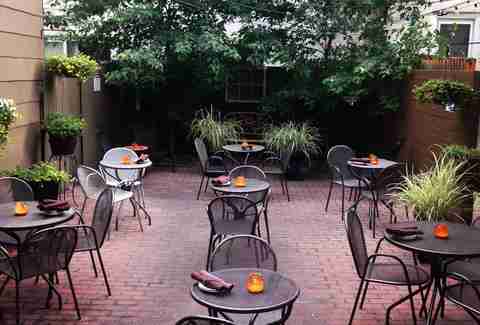 Rouge is one of several high-profile spots lining Rittenhouse Square Park, but it's the only one where you'll feel distinctly Parisian thanks to the spot’s petite outdoor tables. 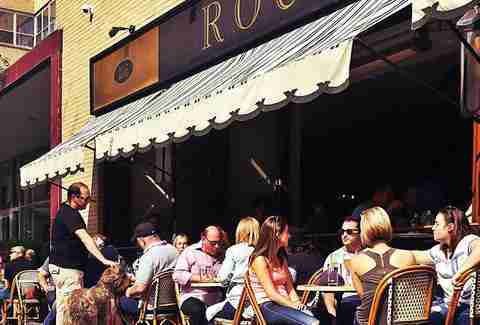 Luckily it’s not all for show; in addition to one of the best burgers in the city, Rouge offers bistro-style faves like steak frites, and an appropriately French-inspired drink menu packed with wine and champagne. 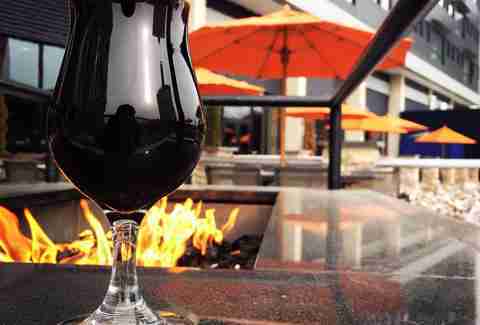 It’s finally time for the City Tap fire pits to be used as decoration, rather than salvation. 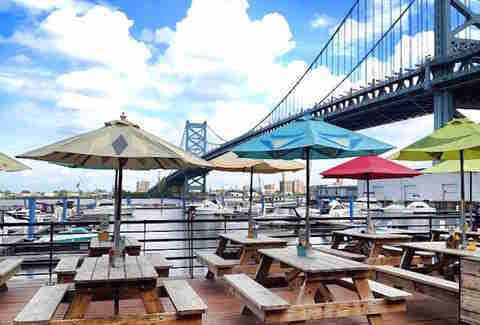 Though the deck stays open year round, to the great pleasure of inebriated Penn grad students who can’t feel the temperature anyway, the City Tap deck is best enjoyed when you’re not wrapped in a parka. Throughout the summer live music events and even an inflatable pool or two help make the most of UCity’s quietest season. 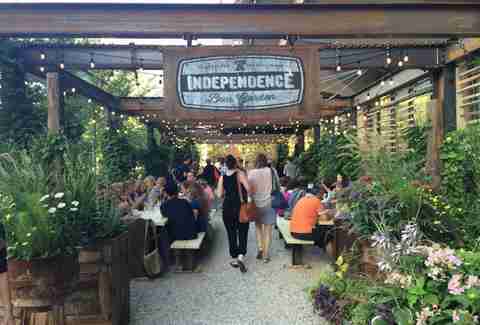 Eat and drink in the most aesthetically pleasing setting Philly has to offer in the greenery-adorned Talula’s Garden, where locally sourced foods paired with an extensive beer, wine, and house cocktail list are almost outdone by the atmosphere -- almost. Marielle Mondon is a Philly-born writer and editor who does NOT have a Philly accent, thank youse very much. Follow her on Twitter and Instagram at @MarielleMondon.